Arguably its most classical timepiece to date, the LM101 Frost from MB&F is decorated front and back in a traditional frosted finish conceived by Kari Voutilainen. 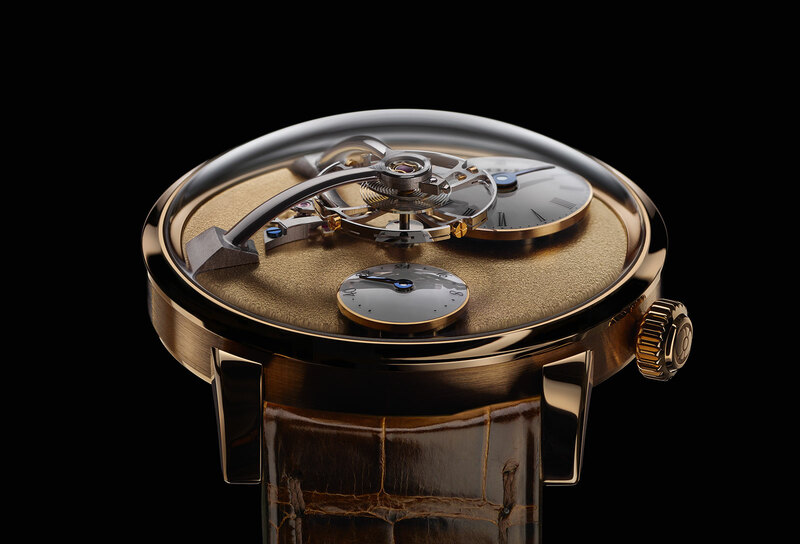 Conceived as avant-garde interpretations of 19th century watchmaking, the MB&F Legacy Machines blend classical watchmaking with founder Maximilian Büsser’s inimitable cocktail of mechanics and design. That 18th century inspiration has reached it Zenith with the LM101 Frost, a pair of limited editions that possess a fine, gilt frosted finish on the dial and movement. 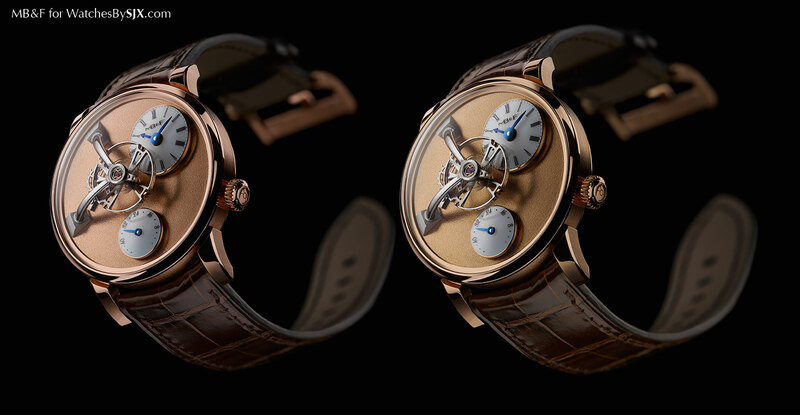 Originally introduced as the most affordable machine amongst MB&F’s offerings, the LM101 is now more elaborate. Inspired by pocket watches from the 18th and 19th century that were often sported a frosted finish, the LM101 Frost features a clever combination of surface finishing that gives that watch an attractive, luxe look. And that finishing, especially the polished surfaces, also means the LM101 Frost looks larger than the typical LM101. A frosted finish is essentially gold-plated surface that has been given a finely grained texture. Traditionally done with various harmful chemicals (a technique Roger Smith still employs), it is today accomplished via inexpensive bead blasting, or in the case of the LM101 Frost, with a wire brush applied by hand. The dial surface is decorated with frosting, with the bezel and lugs mirror polished, a contrasting but complementary finish. 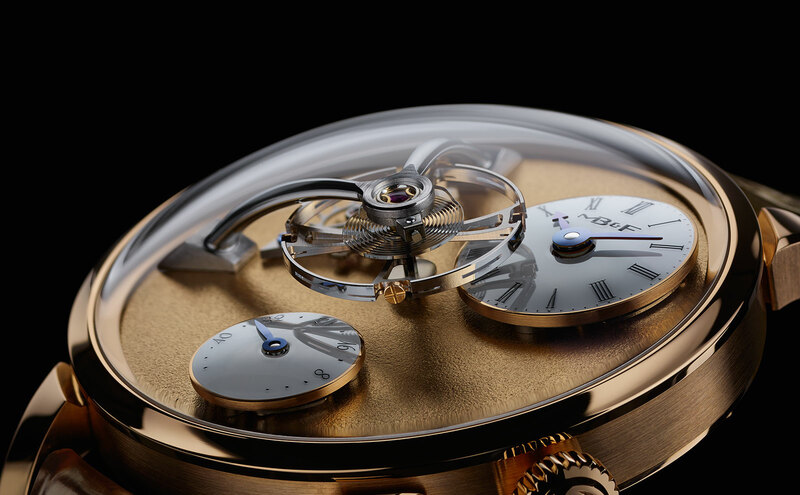 The movement is similarly decorated, with the frosted bridges highlight by polished bevels all round. Blued steel screws and jewels in gold chatons complete the antique pocket watch aesthetic, though the form and finish of the barrel ratchet and winding wheel is evidently modern. 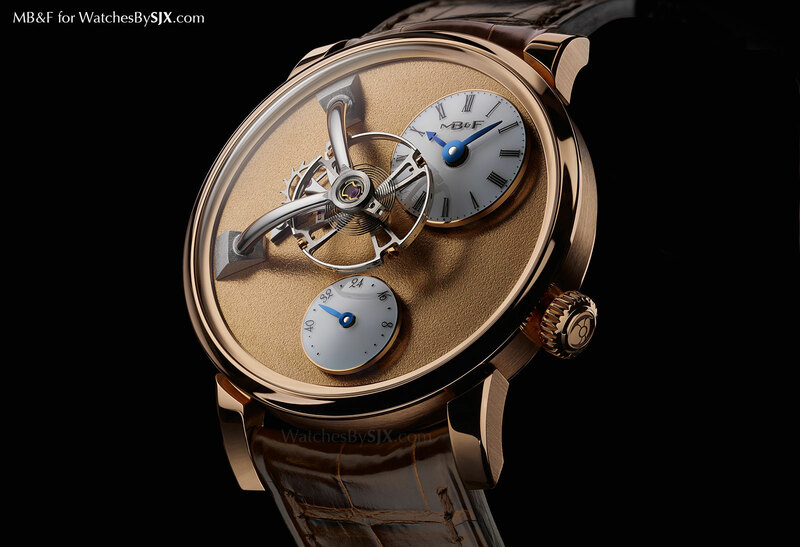 As with the other Legacy Machines, the movement construction and finishing was designed by Kari Voutilainen, but the finishing itself was done by specialists: C.L. Rochat for the movement components and Labarga S.A. for the frosted finish. 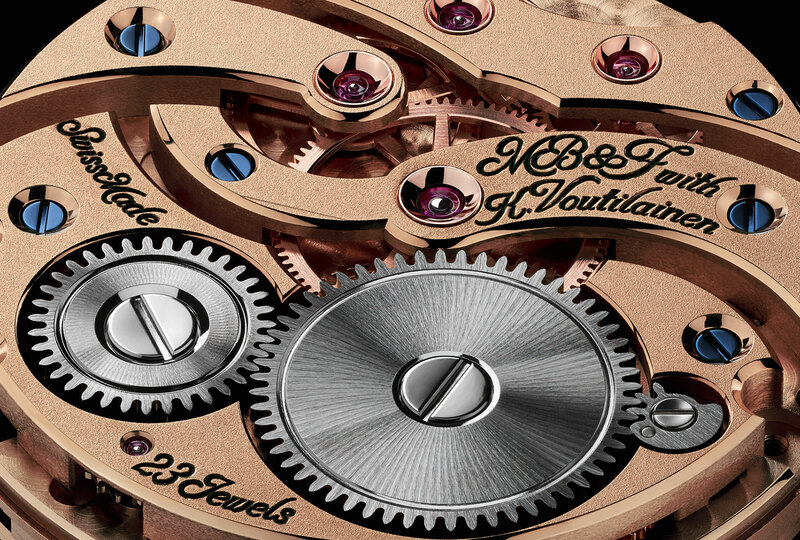 For a sample of Kari Voutilainen’s own frosted finish, the Vingt-8 GMT illustrates it well. Finishing aside the LM101 Frost is identical to the regular production LM101. 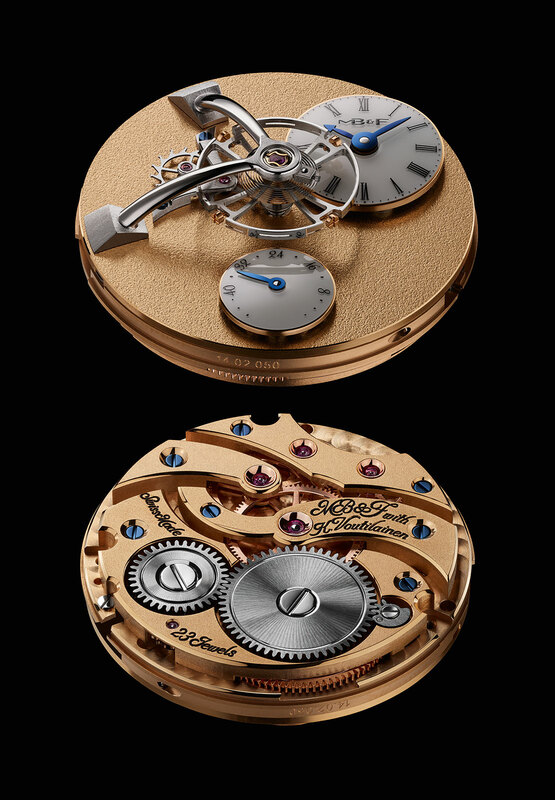 The case diameter is 40 mm, with a hand-wound movement that is equipped with an oversized balance wheel suspended over the middle of the dial. The LM101 Frost will be produced in a limited edition of 33 pieces in red gold, and another 18 pieces in yellow gold – the choice version. This particular look suits yellow gold perfectly. Both are priced at SFr58,000 before taxes.